Up till now, I’ve been making simple notebooks or amending existing templates to create my own notebooks. But now I’m working for myself, I’m starting to have time to create my own designs and templates. This is the first! 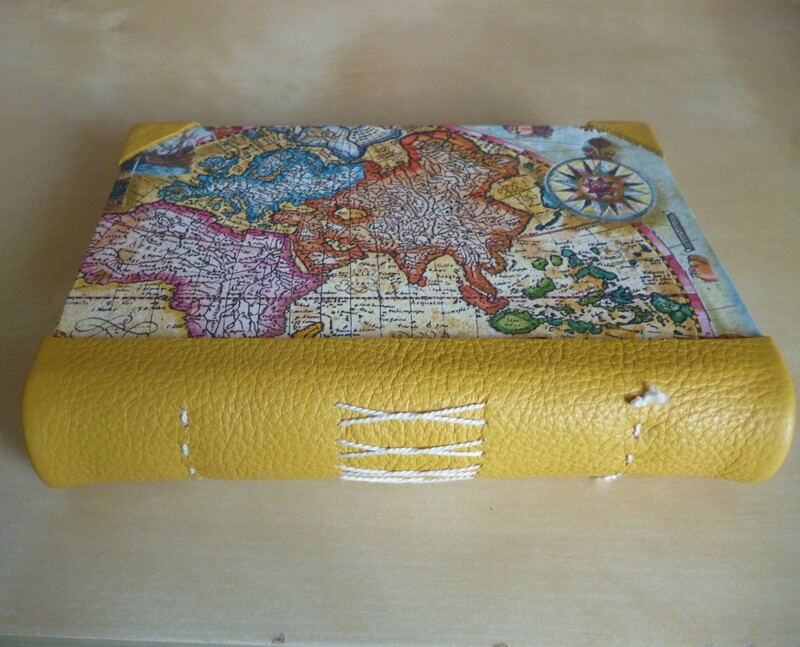 Friends and family have kindly donated old leather bags for me to up-cycle; as soon as I saw this yellow leather, I knew it would work beautifully with the map print paper I bought in Amalfi a few years ago. I’d been hoarding the paper for the right project and this was definitely it. Taking what I’ve learned over the years I’ve been making notebooks, I combined a flexible leather spine with solid boards front and back, covered in that beautiful quality map paper, finishing off the corners with leather for durability (and because it looks gorgeous!). This entry was posted in Craft, Notebooks, Paper and tagged Bookbinding, Handmade, Journal, Leather, Notebook, Sketchbook, travel journal. Bookmark the permalink. Post a comment or leave a trackback: Trackback URL.